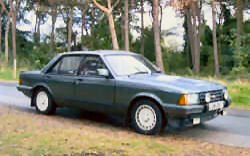 Ford Granada Mark 2 (1977–85). The square and straight-lined Granada '78 appeared in August 1977 and was produced until April 1985 following a mild facelift and attention to drivetrain in 1982. Production continued until 1985 when the very different Mk3 Granada was announced. It was a development of the previous car, the main differences being the "Cologne" V6 engine in 2.3 L and 2.8 L forms replacing the older "Essex" unit (which had never been offerered in the Cologne built Granadas), and the introduction of features such as air conditioning and fuel-injection. Internally within Ford, the "Cologne" 2.3 and 2.8 units were the latest derivatives of the 'V-Taunus' range of engines. The coupé was discontinued when the new model began production, although there was a 2-door saloon version in certain European markets. A relatively low number of vehicles were also produced with the Peugeot 504 / 505 four-cylinder diesel engine in 1.9, 2.1 and 2.5 litre capacities. Most of these went to taxi operators and few survive today. Ford dealer Harold Perry Motors in conjunction with Broadspeed turned this already fine car into something special. Read about the Broadspeed Turbo Granada . . .
As the range matured another two models were introduced. A sports based Granada was introduced as the Granada 2.8 Injection which had white alloy wheels and a rather odd looking black bootlid spoiler. This model borrowed the 2.8i "injected" engine from the Ghia model range. Towards the end of its production run, the introduction of the 2.0 and 2.3 LX saloon and estate UK marketing packs provided versions with a slightly higher specification than the "base" L models. 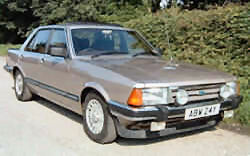 A special Ford of Britain only marketing pack edition of the Ghia X model was later introduced as the "Ford Granada Ghia X Executive" which standardised luxury appointments such as the high grade Connolly Leather interior that had previously been an optional fitment. There was also a special "Taxi" edition, available only in black, which included a foot-operated "panic button" in the drivers' footwell which would operate the alarm system. In addition to these two models the range was complemented by estate models which reflected the same appointment levels as the entire saloon range including the Ghia X, but not the Ghia X Executive model. Page last updated 19:39 Friday 1st January 2016 . If you experience any problems with this website please contact the .